The Premium version of the Virtual Classroom gives you access to additional setup options including adding your brand logo to the Virtual Classroom and deciding whether or not to turn the virtual classroom recordings on or off. These features can be accessed through the Virtual Classroom General Information (Virtual Classroom Personalization) menu. 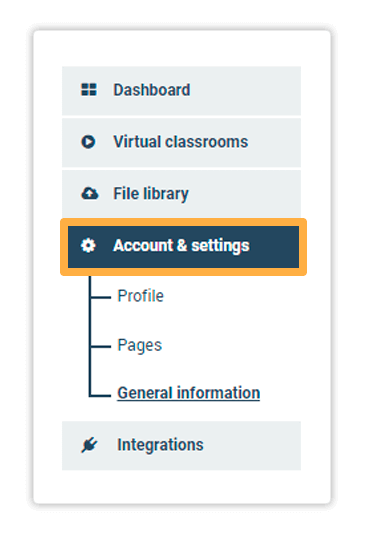 The General Information is the fourth option from the left-side menu items in your Virtual Classroom account. The General Information is in the fourth tab from the left-side menu items in your account. Interactive recordings are on by default. 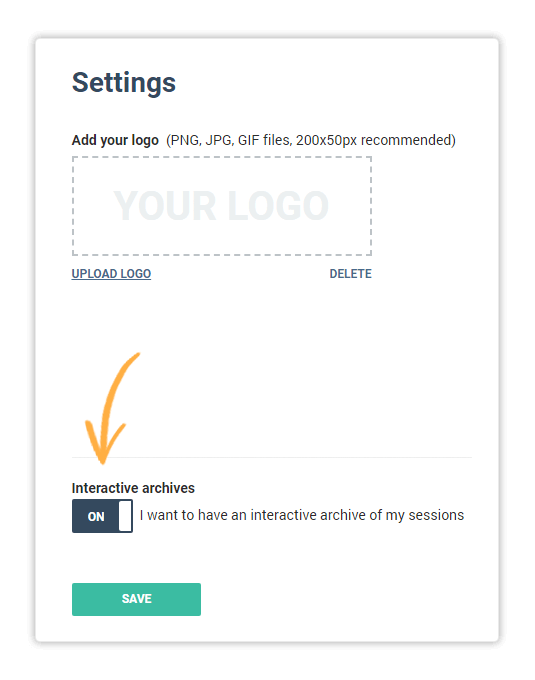 Choosing not to have interactive archives of the sessions means that there will be no way for you to review your sessions afterwards. In order to change the logo your students see inside the virtual classroom, you can upload your desired logo by clicking “Upload Logo”. Keep in mind that the image you upload must not be larger than 200×50 pixels in size. On the right, you can see a preview of how the new logo looks in our Virtual Classroom. The Delete button allows you to remove any logo you upload and revert back to the original Vedamo logo for the classroom.Once you have finished editing your desired settings, click on the Save button to confirm the changes you have made.